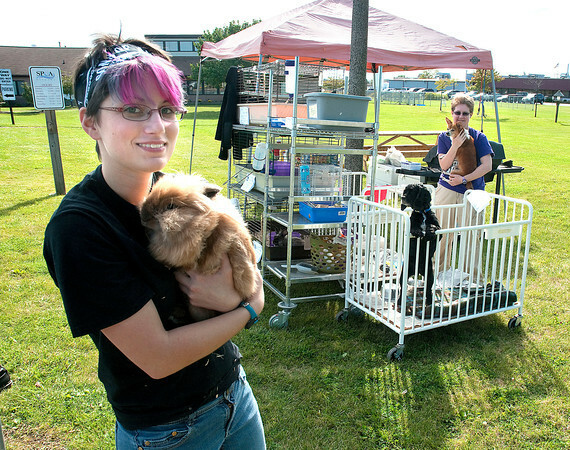 James Neiss/staff photographerNiagara Falls, NY - SPCA of Niagara volunteers Valerie Roffle holds Fluffy the Lionhead Rabbit, left, and Jamie Schupp holds Carlos the dog, outside the SPCA. It was Teacher's Pet=Back 2 School Adoption Bash with dogs costing only $25 and cats $15. The event started Monday Sept. 23 and runs through the end of the month at the Lockport Road location.